A good day out at Mallards Pike today - very, very hot! We split into two groups in order to cover both the Moseley Green area and the SPBF breeding area near the bus shelter at the edge of RSPB land at Brandicks Green. We are in a heat wave this week with the temperature going over 30 degrees which is the hottest since 1976! There is also a report from the RSPB Nagshead site. 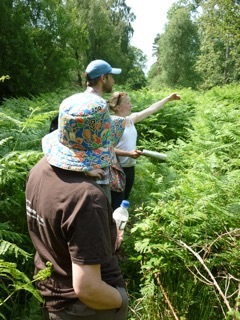 The team are now having to wade through the bracken which is growing very fast and high! 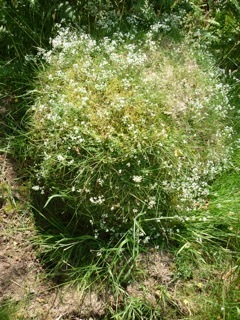 This is a meadow ant's nest which are numerous in the area and it is smothered in Ladies Bedstraw.